MBJ walked away with medals, a trophy, and a cheque valued at $50,000 for their participation, and the grand prize of $500,000 for the charity of their choice thanks to a comfortable 3-0 victory over 24/7 Intouch in the final. The finalists had booked spots to the big dance with semi-final wins over RnH and Police. After a goalless draw in full and extra time, 24/7 Intouch needed one scored penalty to beat RnH in one semi final before MBJ point-blank fired two past Police (2-0). Sectional awards went to top Scorer, Odane Ellis (MBJ Player) and MVP Dwane Braham (MBJ Capt. ), who were presented with trophies for their enthusiastic performances. The eleven invited teams consisted of AllianceOne, Troup & Company, Radius, ACT, GateWay Credit Union, Tankweld Ltd, NWC, MBJ, Freeport Police, 24/7 InTouch, and RnH Party Rentals. With the home team, Vistaprint, included, the company of twelve was split into four groups. With three teams in each group, each team would play against each other of their respective group once, and the winner of the group would move on to the semi-finals. The awards ceremony commenced and Police were handed their third place medals and a basket courtesy of Playscape. Second place 24/7 InTouch was handed their medals and a trophy along with $25,000 for their participation. 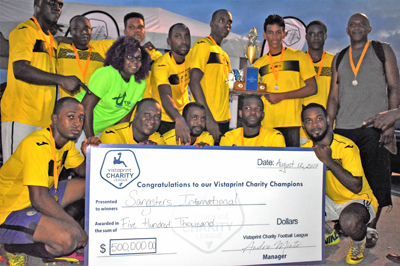 Caption Champions MBJ pose with their trophy and cheque after winning the Vistaprint Charity Football Competition.